It was made from a turtleneck that was kind of ill‐fitting. 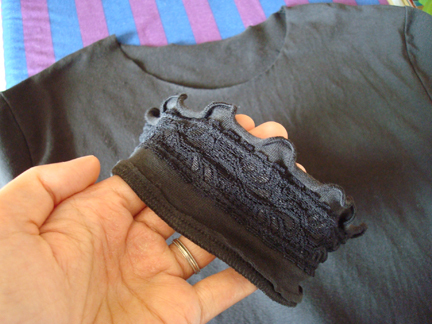 First, I cut off the collar, which has a bit of ruffles and lace on it. 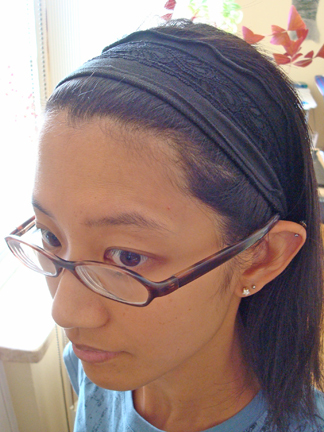 While happily wearing my new headband, I made a Y‐shape cut (can’t help but think of CSI. *shudder*) in the shirt. 1. 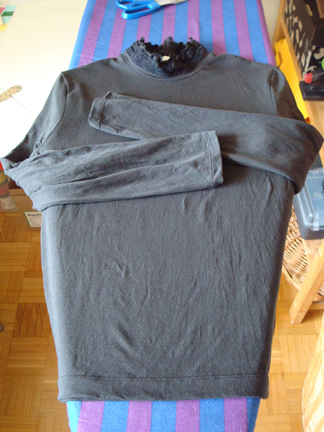 I put on the shirt and mark where I want the lowest point of the neckline (i.e. where the three lines of the Y meet). 2. I then measured the width of the bottom front and divide measurement in half to determine mid‐point. 3. With tailor’s chalk I drew a line from mid‐point to the lowest point of neckline. Then from the lowest point of neckline I drew a line each to the right and left neckline at the shoulder. 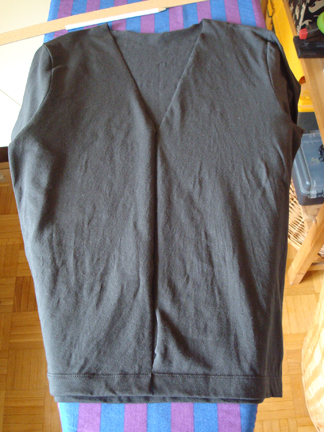 Next, I folded and pinned the edge 1/4″ along the front and neck, and then hand‐sewed it in place with running stitches. 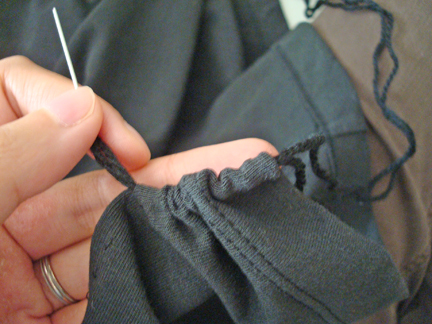 One could definitely sew it with the sewing machine, I just felt like hand‐sewing that day. And I thought hand‐sewn stitches add subtle character. 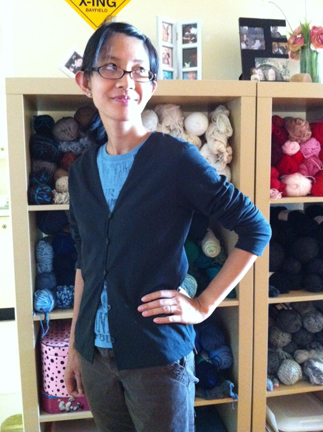 So, for the buttonholes, determine how many buttons you’d like to have and mark where you want them to be. We’ll be working from the bottom up. 1. Thread a needle with approx. 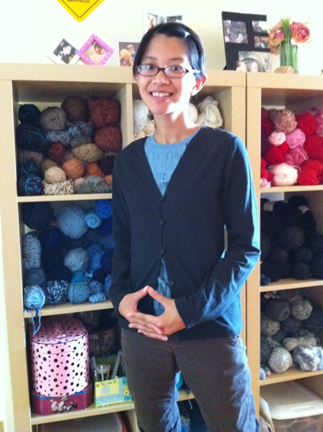 3 feet of DK yarn, double‐knot the end. 3. With yarn still threaded, temporarily set needle aside. 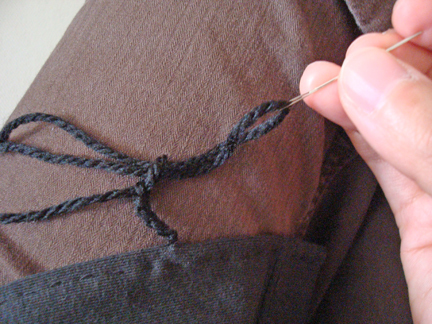 Make a slip knot with the crochet hook as close to the point where the needle came through as possible. Make 4 chain stitches with the hook. 4. Take hook off loop. Pick up needle and insert needle through the loop. 5. Pull the needle and yarn almost all the way through, then tuck on the loop to close it, then continue to pull through the rest of the yarn. 6. Insert the needle 1/2″ up from the beginning of the crochet chain on the fold line of the front edge, and come out another 1/2″ up from where the needle was inserted. (I messed up the first stitch. There should have been more distance between the crochet chain and the next stitch on the fold line.) One buttonhole made. 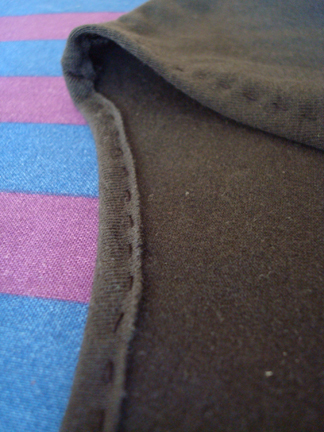 Continue to make stitches 1/2″ apart until you reach the next buttonhole mark. 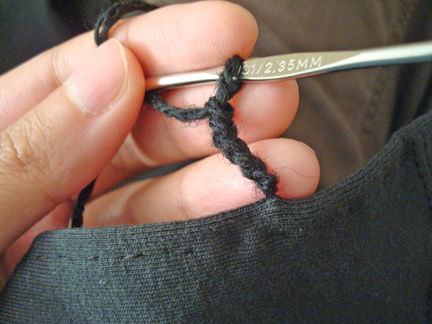 Then repeat steps 1–6 for buttonhole. I LOVE the crochet button holes…such a CUTE idea!! And isn’t it great when you can use every part of the original and nothing gets wasted? Crocheted buttonholes are a super awesome idea! You are so clever, I’m definitely going to try this when I next need a buttonhole!